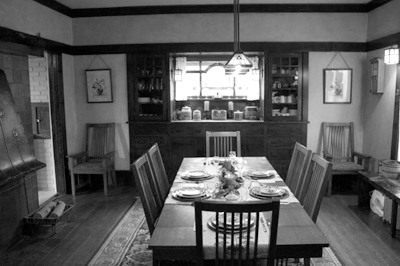 The Arthur G. Martin House, which is on the Holiday Historic House Tours, is an excellent example of the American Arts & Crafts (Craftsman style) attributed to a a commissioned Gustav Stickley design. Pictures of the home are featured on pages 438, 439 and 440 of the bood "Stickley's Craftsman Homes", by Ray Stubblebine. Arthur G. Martin, mayor Fairmont, had the home built as a family residence in 1911. 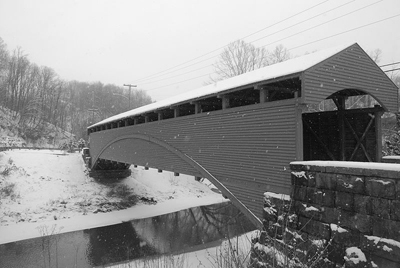 The Barrackville Covered Bridge spans 145 feet (44 m) in a single span across Buffalo Creek near Barrackville, West Virginia. Built by in 1853 by local bridge builder Lemuel Chenoweth, the structure is a modified arched Burr truss, with siding added twenty years after the bridge's construction. Fairmont State University is a public university located in Fairmont, West Virginia, USA. Enrollment of the university is about 7,700 and offers masters degrees in business, education, teaching, criminal justice and nursing in addition to 90 baccalaureate and 50 associate degrees. Fairmont State was founded as a private institution in 1865 in the basement of the Methodist Protestant Church at 418 Quincy Street. 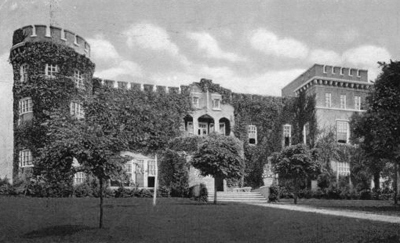 It was known as the West Virginia Normal School at Fairmont and was dedicated to educating teachers. March 9, 1868, it was purchased by the state from the Regency of the West Virginia Normal School which had been formed in 1866. With this purchase, this private normal school became a branch of the State Normal School at Marshall College. From 1868 to 1892, the school was known variously as Fairmont Normal School, the Fairmont Branch of the West Virginia Normal School, the Branch of the West Virginia Normal School at Fairmont, a branch of the West Virginia State Normal School at Marshall College, but most commonly as Fairmont State Normal School. By 1892 the designation of "branch" had fallen into disuse by FSNS. 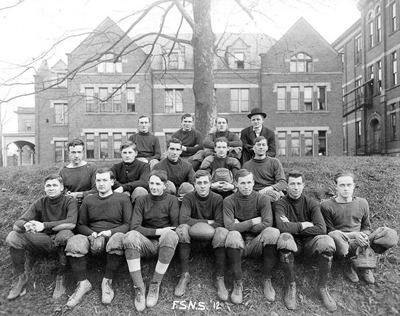 It was renamed Fairmont State Teachers College in 1931 and Fairmont State College in 1943. On April 7, 2004, Governor Bob Wise signed legislation changing its name to Fairmont State University. The Woman's Club of Fairmont is a not for profit group of women dedicated to the improvement of Fairmont, West Virginia. The Club was founded in 1906 to "promote mutual counsel and sympathy and unity of action among its members, the advancement of various interests of women, and the improvement of the civic, social, moral and educational conditions of the City of Fairmont." The Woman's Club of Fairmont is also affiliated with the General Federation of Women's Clubs, an international organiation dedicated to the improvement of communities throughout the world. Membership in the Woman's Club of Fairmont also entitles you to membership in the district, state, regional, and international clubs. The seeds of a Father’s Day Service were planted on December 6, 1907, when a horrible mine explosion at Monongah, West Virginia, killed more than 360 men, 210 of whom were fathers. 250 widows and more than 1,000 children were left grieving. Thoughts of these lonely persons touched Grace Clayton deeply. The Fairmont Times of September 23, 1979 shares this quote by her from Glenn Lough, Marion County Historian. “It was partly the explosion that got me to thinking how important and loved most fathers are. All those lonely children and those heart-broken wives and mothers, made orphans and widows in a matter of a few minutes. Oh, how sad and frightening to have no father, no husband, to turn to at such an awful time. ” She suggested to her pastor, Reverend Robert Thomas Webb at Williams Memorial Methodist Episcopal Church, South, that it would be wonderful if fathers were given a special day to be honored and remembered. So, she suggested the Sunday closest to her father’s birthday, which would be July 5, 1908. 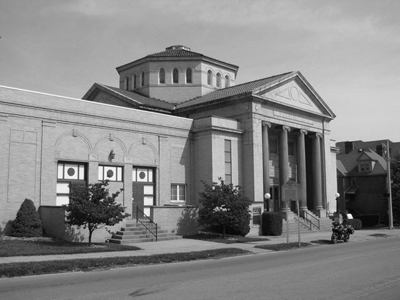 History now shows that Fairmont held the first Father's Day Service in America on July 5, 1908 at Williams Memorial Methodist Episcopal Church, South; now known as Central United Methodist Church. High Gate was built in 1910 by James Edwin Watson, the four son of James Otis Watson, James Otis Wason was known as "the father of the West Virginia coal industry" which he started in the 1850s. He formed the American Coal Company which was later to become Consol. 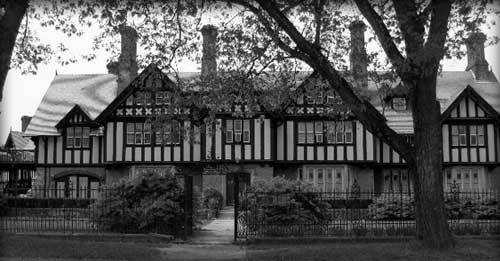 The house was designed by the famous architect, Horace Trumbauer of Philadelphia in the Elizabethan half-timber style. The entrance vestibule is paved with white Vermont marble and trimed wth pink Tennessee marble. The floors are of parquetry design with mosiac of oak and moahogany, the interior walls are paneled in oak, handrails of the stairway and moldings ae hand-carved, mantelpieces on the first floor are ot elaborately carved Italian marble a butler's pantry contained a sink of German silver; ceilings are ornamented with plaster designs of oak leaves and acorns. There is an elevator. The house has 25 large rooms. The coach house, also of half-timber, is almost as elaborately furnished as the house. Between the coachhouse and the house was a fine tennis court, where many of the country's leading players competed for the coveted thousand dollar Tiffany cup. Here President Taft was entertained as wre many other famous figures. James Edwin Watson died in 1926 and in 1929 High Gare was sold to the Sisters of St. Joseph as and rest home as well as a kindergarten. In the 1950s it was purchased by the Ross Family. The downstairs is a Furneral Home and the family resides upstairs. The interior of the home remains the same as when it was built and some of the original furnishings have been returned. The Robert H. Mollohan-Jefferson Street Bridge, also known as the Million Dollar Bridge, or the High Level Bridge is located in Fairmont, West Virginia. It was dedicated on May 30, 1921. This bridge connects east and west Fairmont, and crosses the Monongahela River. After falling into poor repair over the years, it was preserved and repaired and reopened in October 2000. 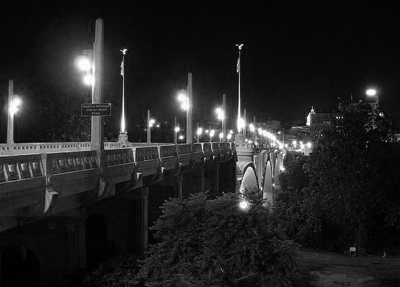 The bridge is now a significant historic landmark in the city. Sonnencroft (also known as the Clyde E. Hutchinson House) was a historic residence located along Morgantown Avenue (near the present site of East Fairmont Junior High School) in Fairmont in the U.S. state of West Virginia. Sonnencroft was completed in 1912. It was a huge stucco and tile mansion based on the Inverness Castle in Scotland. The fortunes of the coal industry reversed during the Great Depression and in the 1960s the abandoned residence was razed in order for the property to be donated to the Marion County Board of Education.